I swear that there are some sort of rabbits hiding in my laundry cause it seems to multiply every time I look at it. Seriously, I feel like I can do 3 – 5 loads a day and never catch up. Is that an ADHD thing, do you think, or does everyone have this problem? And the worst thing about laundry? 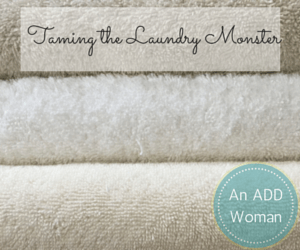 I’ve got a few ideas for helping you tame that laundry monster, or at least get him down to a more manageable size. Don’t get crazy with sorting. I wash all of my clothes together, including my white socks. My son and husband will often separate their whites from colors, but that’s their choice. Let each person do their own laundry. Of course, if you have very small children, this isn’t possible. But anyone over the age of 10 is a different story. Each of my children was given instructions on doing 1 load of towels per week once they reached the age of 10. Towels are easy to do and always needed. I totally understand the size of your laundry pile. It’s ginormous and overwhelming. But throwing a too big load of laundry into your machine defeats the purpose. 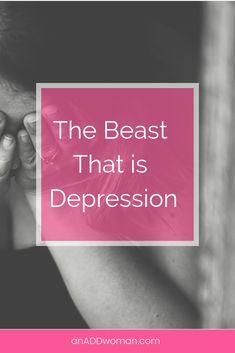 You put too much of a strain on your washing machine, the clothes don’t get as clean as they should, and the results coming out of the dryer are equally ginormous and overwhelming. That means that they will probably sit in the laundry basket rather than get put away. They won’t make it out of the laundry room. And before you get anywhere near the bottom of the basket, half of them will be all over the floor and you won’t know if they’re dirty or not. A smaller load makes it easy for me to take it down 2 flights of stairs to the basement and to bring it back up again. A smaller load is easier to put away because it’s just a few things. Just make sure that they are essential things you need and will wear. Doing a small load of sweaters in July is less than no help at all. Use products that work for you. Buying cheap detergent that doesn’t do the job all the way is a waste of time and money. Buy things you know will work. And along those lines, choose products with the least aggravation factor. I found a great sale on liquid detergent and bought it. The extra big size with the tap on the side. But because it was liquid and a tap, it dripped. Everywhere. On the washer, the dryer. It made a huge blue mess. And every time I did laundry, I was also taking time to clean the latest mess up. No more. I buy those pod kind of things and I’m done with it. That’s also why I use dryer sheets instead of liquid fabric softener. ave often advocated the use of DIY laundry detergent; I’m still OK with that. But take a look at your situation. If buying the ingredients and mixing it up and always making sure you have plenty on hand is too much for you – stop. There are safe alternatives out there if you look. 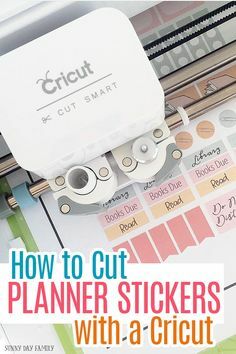 I’m not asking you to put it in your planner – unless that will work for you – but with things like laundry that need to be done on a regular basis, make it just that. Regular. Maybe you do 2 loads every other day. Or you spend all day Monday running the washer and dryer. Whatever works for you and your family. Making it part of your routine means it turns into a habit and a no brainer. Something you do automatically without thinking. Buy more of stuff you run out of. If you’re running out of socks, underwear, towels, or whatever in between laundry days, buy some more! That’s good advice that a friend gave me at the time. Another good idea – especially if you have children in the home – is to keep one outfit tucked away somewhere for an emergency, like waking up and finding out you forgot to put the load of socks and underwear in the dryer. Kind of like the preschool does in case anybody has an accident. Do it for you, too, if you need to. Benjamin Franklin always said that 2 things were certain in life: death and taxes. If you liked this post, be sure and share it on social media. Thanks!